Folegandros can be found in the Southwestern part of the Cyclades island complex. It has an area of 32km2 (12mi2) and 650 inhabitants. 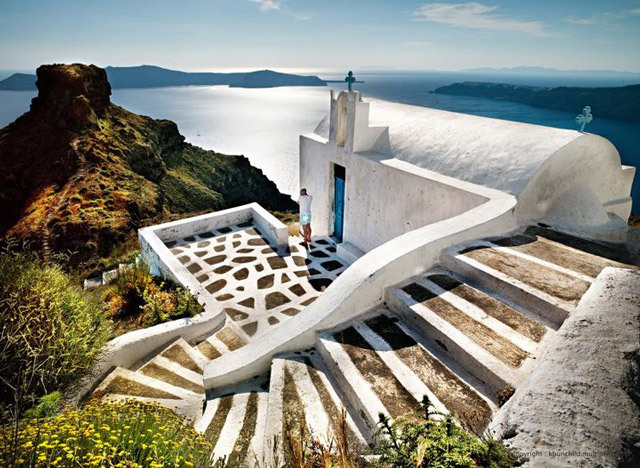 The island has 3 major villages, Chora, Karavostassis and Ano Meria. Chora, which is also the capital and is built on the breathtaking edge of a cliff 200m above sea level. Perched above chora is the church of the Virgin Mary, the biggest on the island. Karavostassis is the port of Folegandros and from there you will find roads leading to the rest of the island. Ano Meria is the second largest settlement and it is an agricultural community. Folegandros has a variety of beaches mostly accesible by foot or boat only and some by car or bus like, Aggali and Livadi. Interesting information about Folegandros can be found through the Greek Travel Pages (GTP), the municipality of Folegandros and Wikipedia. Karavostassis, which is situated on the southern side of the island. Ferry connections and schedules for domestic routes, like Ios, are usually announced by most shipping companies, a couple of weeks before the beginning of each season. There are some exceptions though, like Blue Star ferries, which announces schedules in the beginning of the year. Information concerning Athens ports serving routes to Folegandros can be found further down.